This case highlights a unique program for students pursuing a graduate degree in accounting. The program’s mission is to prepare students to be effective leaders and communicators in their careers. To accomplish this mission, the program has developed a Leadership and Professional Development Center (LPDC) that uses physical, virtual, and external space to support programmatic goals through cross-disciplinary collaboration. The LPDC houses trained consultants who provide services such as feedback on written documents, mock interviews, presentation assessment, and self-awareness development. The LPDC also hosts workshops on a variety of leadership and professional development topics. Furthermore, consultants partner with faculty and professionals to provide instruction and experiential learning inside and outside the classroom. 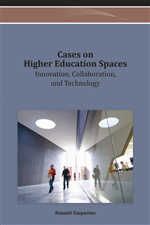 The goal of this chapter is to highlight how cross-disciplinary partnerships promote learning in physical, virtual, and external spaces. Recommendations for navigating and utilizing cross-disciplinary collaborations are provided as well as suggestions for implementation in various learning spaces. In 2010, the Department of Accountancy contacted Ernst & Young (E&Y) about providing support for an innovative space designated to assist LMAS students’ leadership and professional development. In exchange for naming rights, E&Y agreed to endow the space with an initial commitment of $500,000 funded over a five-year period. The endowment generates an estimated income of $20,000 per year and provides funds needed for technology, workshops, student activities, and self-assessment tools. The LMAS program and the LPDC represent extensive collaboration efforts and cross-disciplinary coordination inside and outside the academy. Outside the academy, the corporate sponsor provides not only funding for the space, but also a needed external and employer perspective. E&Y partners and professionals serve on the Department of Accountancy’s executive advisory council and provide regular feedback to faculty about curriculum issues and perceptions of student technical and professional skills. Inside the academy, the LMAS program utilizes the management department housed in the business school to teach a required course examining managerial leadership. Individuals from a variety of disciplines inside the academy also have partnered to contribute leadership and programmatic direction for pedagogy within this space. Specifically, individuals from communication, English, management, accounting, and technical services have partnered to develop programs and a space to serve students in the LMAS program.